The recipe doesn’t specify whole wheat tortellini, but that’s what I opted for. I also lightened it up by using almond milk and Greek yogurt instead of cow’s milk and cream cheese. Preheat oven to 350. Cook tortellini according to package directions and add peas and carrot for the last minute of cooking; drain. While the tortellini is cooking, in a 12-inch skillet melt butter over medium heat. Add mushrooms and cook until tender – about 5 minutes – then remove from skillet. In a screw-top jar combine veggie broth, flour, oregano, garlic salt and black pepper. Cover and shake until smooth. Pour into the same skillet and add milk. Cook and stir until thickened and bubbly. Add cream cheese (yogurt) then cook and stir until smooth. Remove from heat and stir in lemon juice. 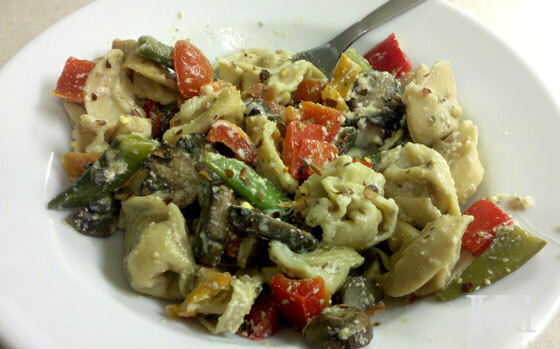 Finally, stir tortellini mixture, mushrooms, tomatoes and sweet pepper into skillet mixture. Spoon it all into an ungreased 3-quart baking dish. Bake, covered, about 30 minutes or until heated through. Top with grated Parmesan cheese. This was so tasty and made enough for a few meals. I topped mine with sea salt, garlic powder and crushed red pepper. You could use any number of vegetables in this recipe – spinach, zucchini, asparagus. Next time I would also consider sautéing some minced garlic with the mushrooms for added flavor.